Do you ever have those trips where some details are intensely more vivid than others? For me, those details typically revolve around food. I have a friend heading out to Puerto Vallarta after the New Year and she asked me for recommendations on places to eat and things to do. Luckily for her, my tastebuds (okay, and my travel journal) wouldn’t let me forget my favorite places and things to eat while I was in Puerto Vallarta in almost exactly two years ago. During my trip, it was clear that a few new restaurants that had popped up since my last visit to PV (which was my senior year in high school…yikes!) and it was a bit overwhelming trying to figure out where to get the best food in a touristy location. Nearly every restaurant we passed in the downtown area had someone trying to lure us in or huge signs promising the best *insert food item here* and I found it hard to make a decision. 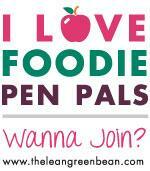 There were also all sorts of ads for food tours but I found myself not really being drawn to one in particular. So, I decided to create my own taco crawl. And let me just tell you, this was an awesome idea! Thanks to the (usually) helpful Yelp and Trip Advisor reviewers, I ventured to a variety of restaurants and stuffed myself with the most delicious tacos I’ve had in a while. The lighting was bad, but the food was not! I enjoyed my fresh mahi mahi tacos with an ice cold Pacifico beer. Walking into the restaurant reminded me a lot of an Applebee’s or a Cabo Wabo with loud music, knickknacks on the walls, and drink specials. However, the food was actually quite tasty. I ended up here a few times on the trip, sometime for food and sometimes for drinks. It’s a really easy-going vibe, despite being a tad touristy. They have a great full bar with tons of options for anyone needing to indulge in an adult beverage. Despite being on the same street (and only a few shops down) Pancho’s Takos felt a lot less touristy than Joe Jack’s and had more taco options. Using their ordering form, I wrote in the number of each kind of taco I wanted and waited patiently for a man yielding a huge machete-looking knife to carve off some pork for my tacos. Then, a few moments later, my taste buds and I discovered that Pancho’s Takos had my absolute favorite tacos in Puerto Vallarta. Hands down. The al pastor tacos are out of this world. The pork was so tender and the pineapple was perfectly caramelized. Plus, I HATE cilantro and the were happy to accommodate my wishes that it not touch my plate. I was a happy girl. The restaurant itself has beer, waters and sodas available for your drinking pleasure. Indoor and outdoor seating is available, too. Third stop: Al pastor tacos from Tacos Las Gueras located at Venustiano Carranza 493. 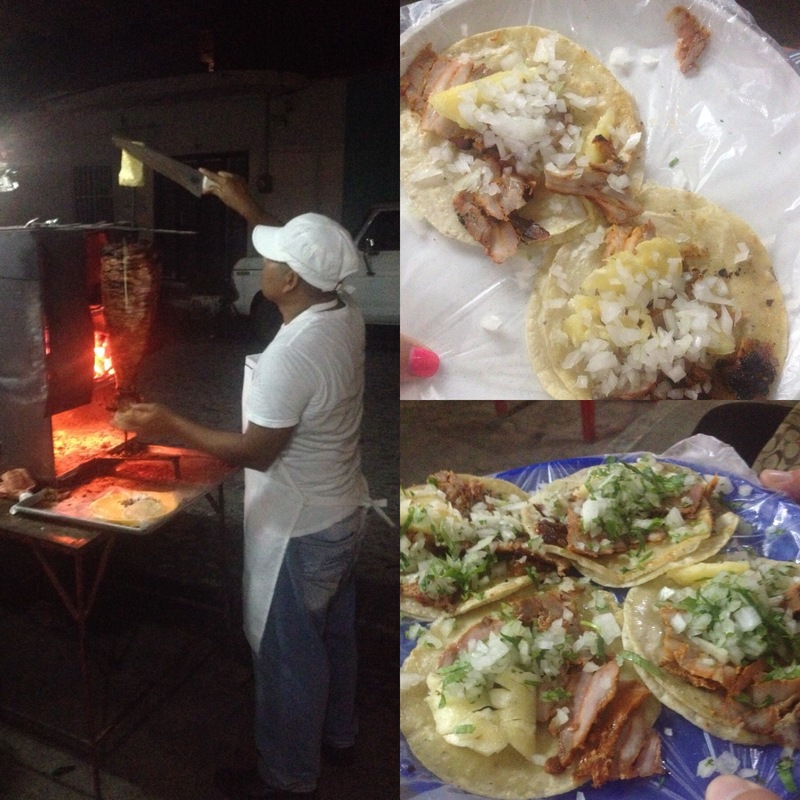 Tacos Las Gueras is arguably one of the best street taco stands in PV, if you can find it! At first, its appearance is a little.. interesting. I’d walked by it twice before realizing I was in the right place. The restaurant is almost completely outdoors. The kitchen is more like a stand, with a wonderful woman in the center making tortillas from scratch and a man outside the stand shaving off slivers of pork and pineapple to top each tortilla. On the back end of the stand, there’s a condiment bar to load up on sauces and toppings of your choosing. Mismatched plastic lawn chairs line the wall facing the stand, serving as literal front row seats to watch your delicious tacos being made and for you to sit while you enjoy your meal. If you can get over the aesthetics, I think you’ll agree that the tacos are fantastic. Some even argue these are better than Pancho’s Takos (I respectfully disagree, but they are a close second). 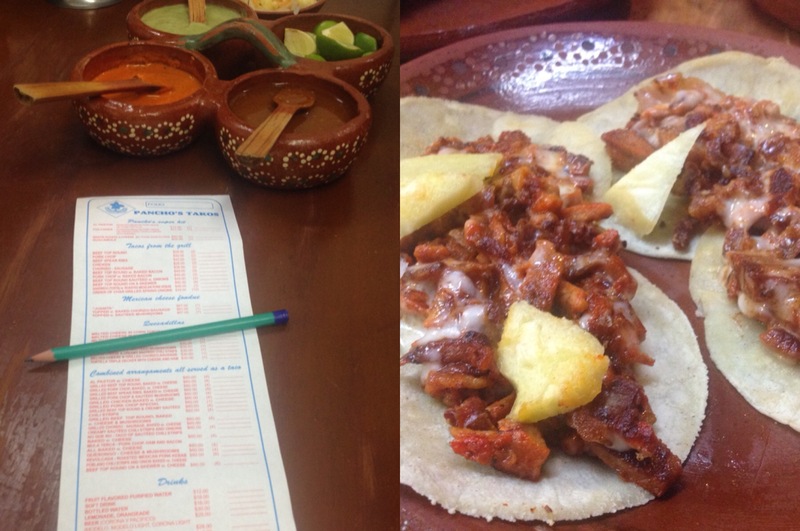 Either way, Tacos Las Gueras is a huge hit among other visitors, as shown on their Trip Advisor page linked above. 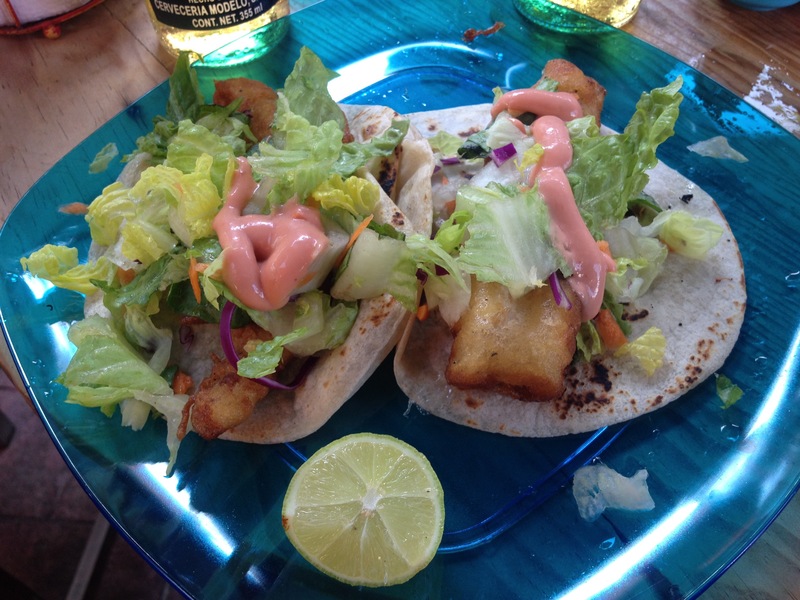 Extra Credit: The Real Fish Taco located in Sayulita atCalle Delfin 10. Okay, so this restaurant isn’t in Puerto Vallarta, it’s about an hour or so away in the adorable beach town of Sayulita. Here is where I found the most amazing fish tacos I’ve ever bought. The restaurant has both indoor and outdoor seating, so I sat outside under an umbrella to enjoy the gorgeous day. Paired with a tasty Corona, these fish tacos were so fresh and so tasty, I wanted to order more to go! While falling in love with these tacos, I was simultaneously falling in love with the town of Sayulita. I know that I will definitely be back to explore this small little slice of heaven located right on a gorgeous golden beach! I had a blast exploring the area in search of my favorite taco. There are a ton of other restaurants that I’d love to check out on my next trip to Puerto Vallarta. I hope my friend is able to try out the restaurants above and give me some new places to try on my next trip to PV. What are some of your favorites in or around Puerto Vallarta? 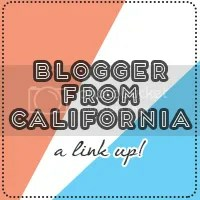 Posted in Travel Adventures and tagged food, Mexico, Puerto Vallarta, travel. Bookmark the permalink.